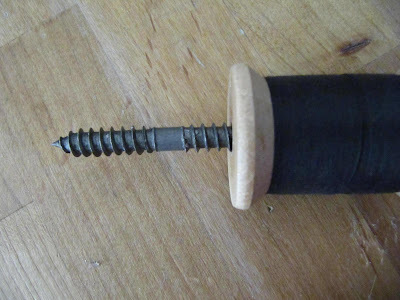 No, I really do have a screw loose...in Sew Many Ways! Ahhh, that was a good one. 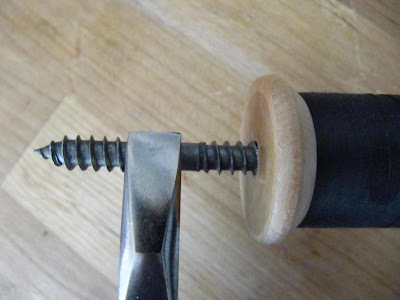 Well, here we are at another Tool Time. Welcome old and new friends. This one is an easy one, but still I can't cut down on the number of pictures. Just rummage through that box of old screws or shop around the hardware store. There are so many different screws it's ridiculous...and you know me, I'll find something fun to do with them. No jewelry this time I promise! 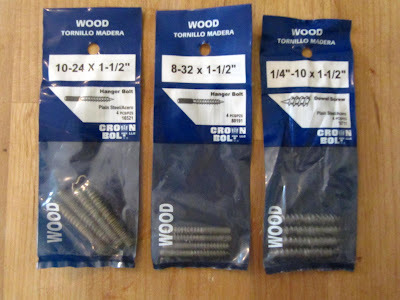 These are a few different ones that I used. Here are two quick tutorials for some fun sewing things. 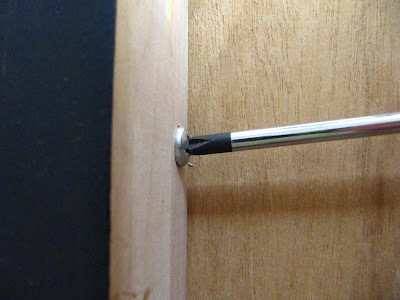 The first is a new drawer pull. 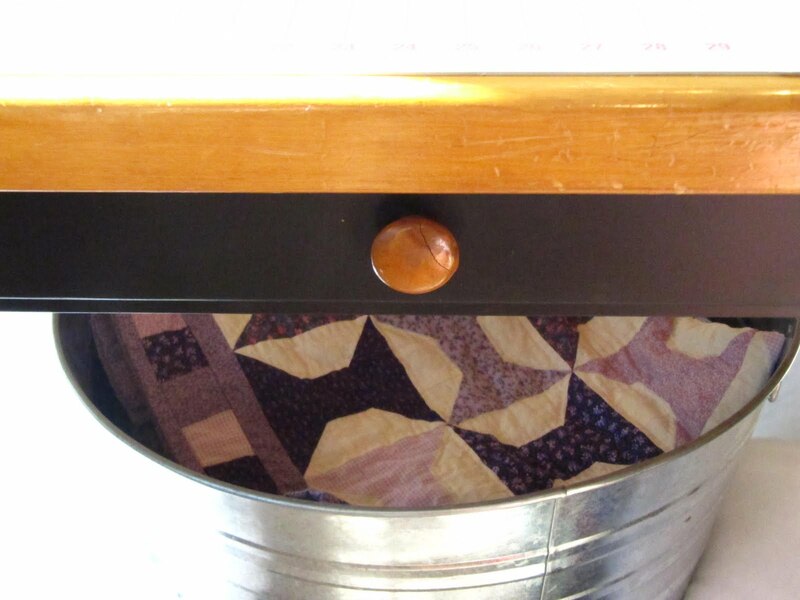 This is my cutting table and there is a small drawer in the front. 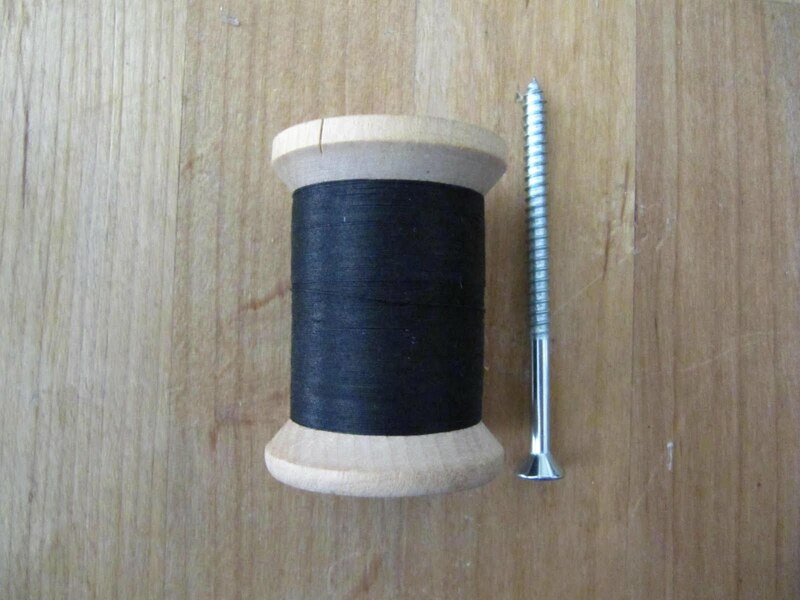 This is an old wooden spool of thread from my mom's sewing things. 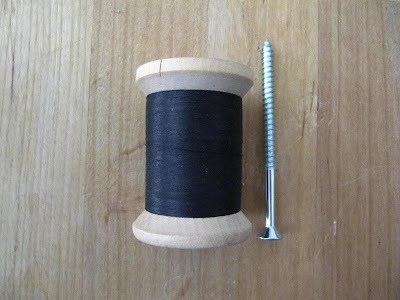 The first step is to separate the thread a little with your finger nail. This next picture could be upsetting to some thread lovers, so look away!! Trust me, it didn't hurt one bit. I still wanted to put a little band aid on there just in case. 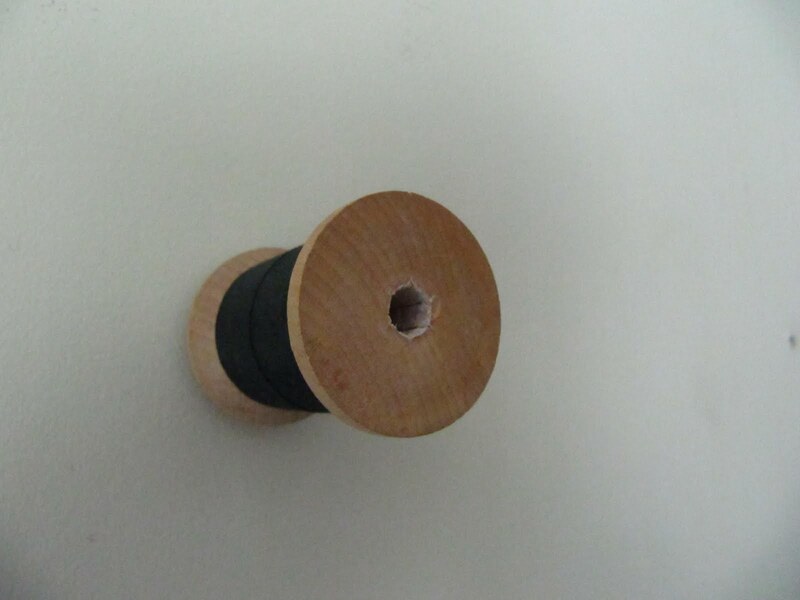 I Mod Podged the thread before and after the drilled hole just to prevent the thread from unraveling. 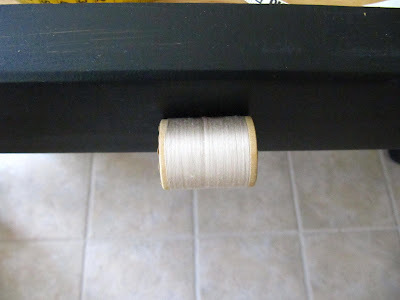 If you want to keep the spool clean, you can paint the whole spool to seal it. It dries clear. Now take off the old knob, but keep the original screw in there. 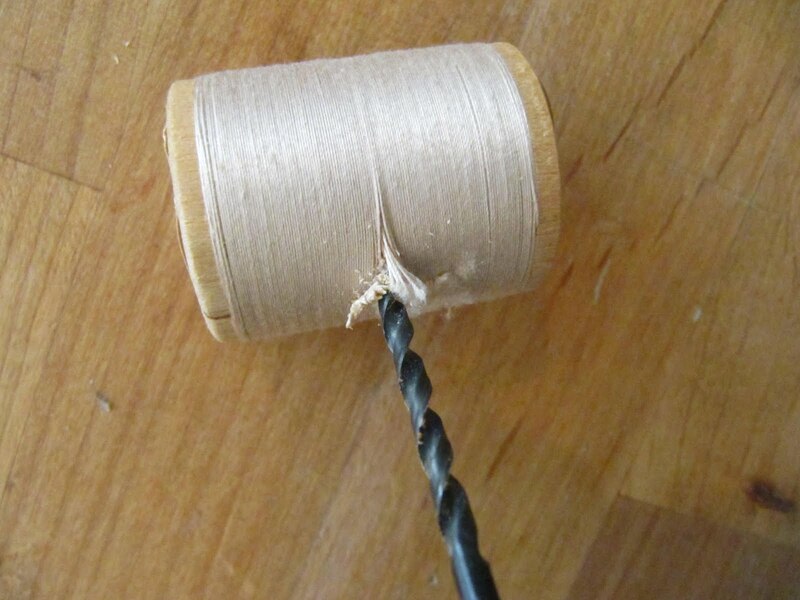 Twist the original screw into the hole that you drilled in the wooden spool. Tighten from the inside the drawer. 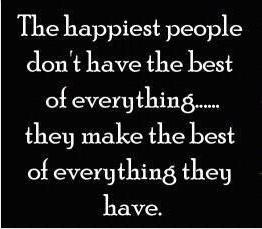 and here you have it. 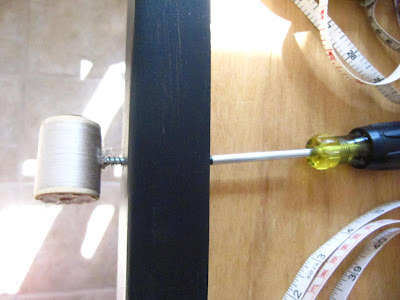 The sweetest little knob for my sewing room. Easy to grab onto too. It also brings a little memory of my mom where I can see it every day. 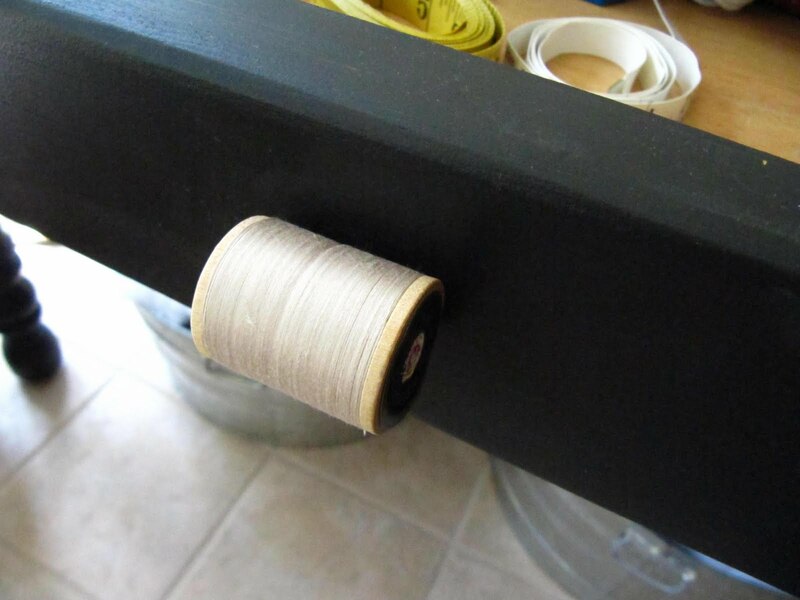 I didn't plan on using her spool today, I just grabbed it. She passed away three years ago on June 3rd, so this is extra special that I would pick this out of the blue today. I think she's looking down on me. 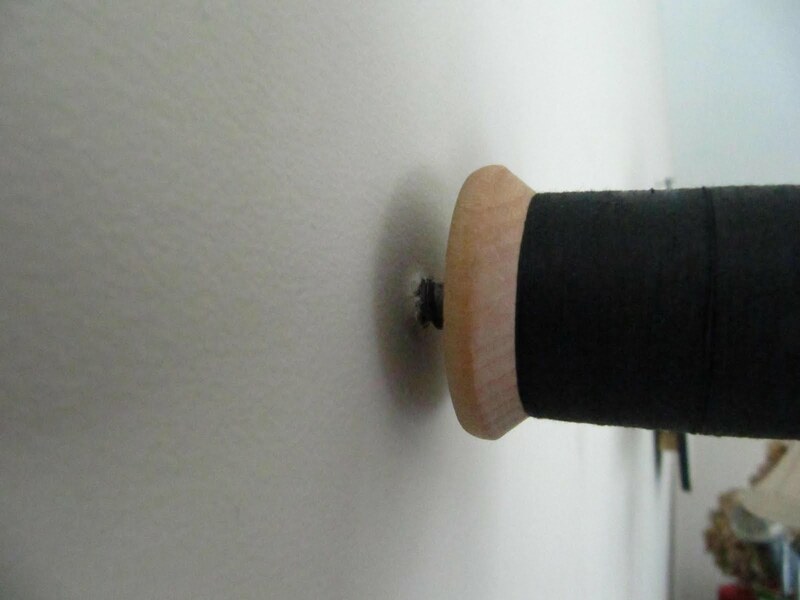 However, I don't think she knew I would use a drill on her thread!! Here's the second tutorial in "I think I have a screw loose Tuesday". 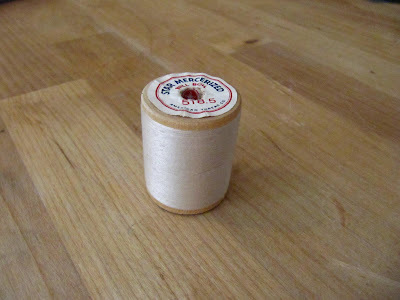 It's a spool of thread used for hanging things on. Not one of my snappier names, but it's almost midnight on Monday. How about spool hanger or spoolanger... or thread hook or throok. Ok, I think my screw is getting looser. 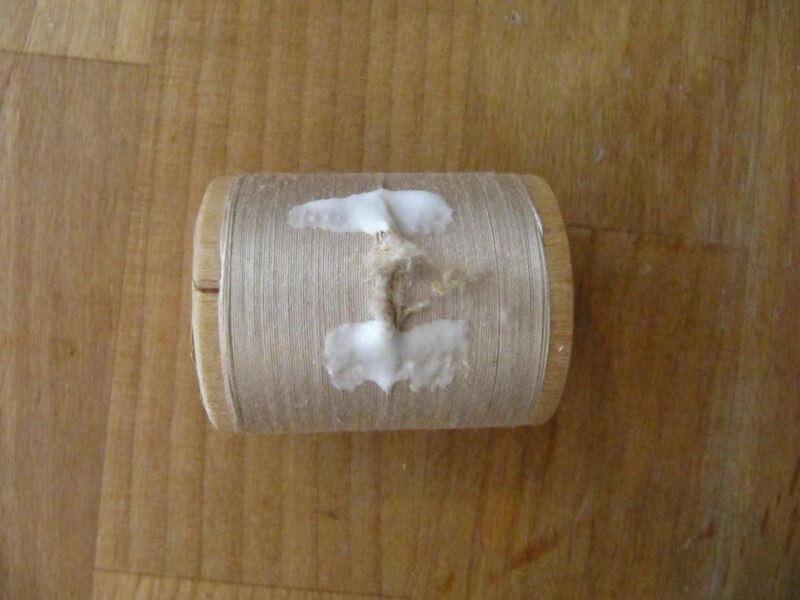 Start with a nice wooden spool. 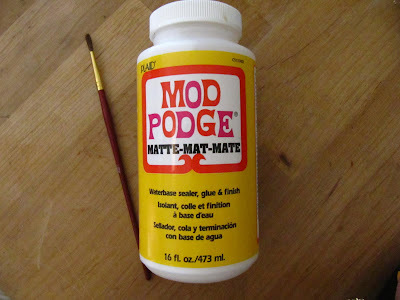 If there's thread on it, seal the end with glue or Mod Podge again. 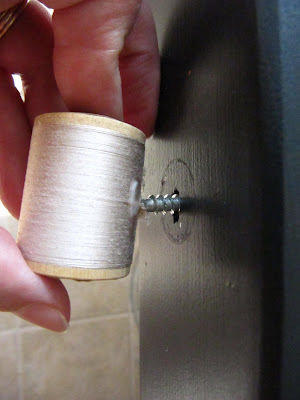 Now find a screw that fits your spool and have an inch or so longer to grab onto the wall. 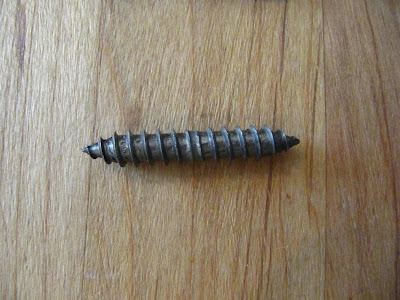 You might have to select the proper screw for the surface you are attaching it to...like plaster, wood etc. 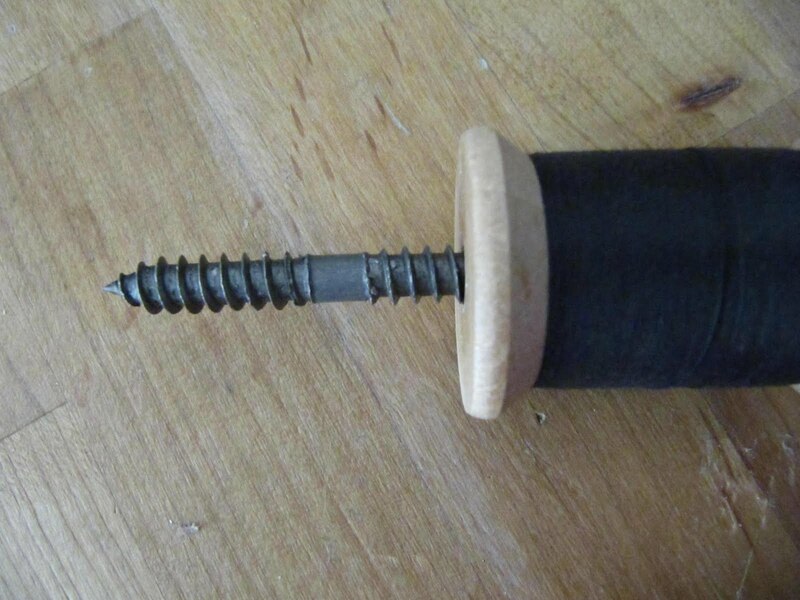 Make sure the end of the screw doesn't slip through the hole in the spool. 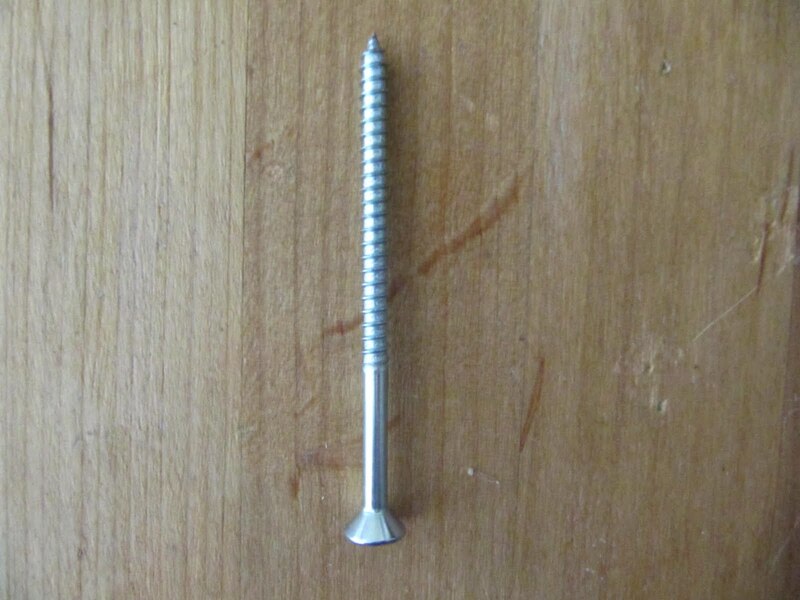 All you have to do is just screw it into the wall. 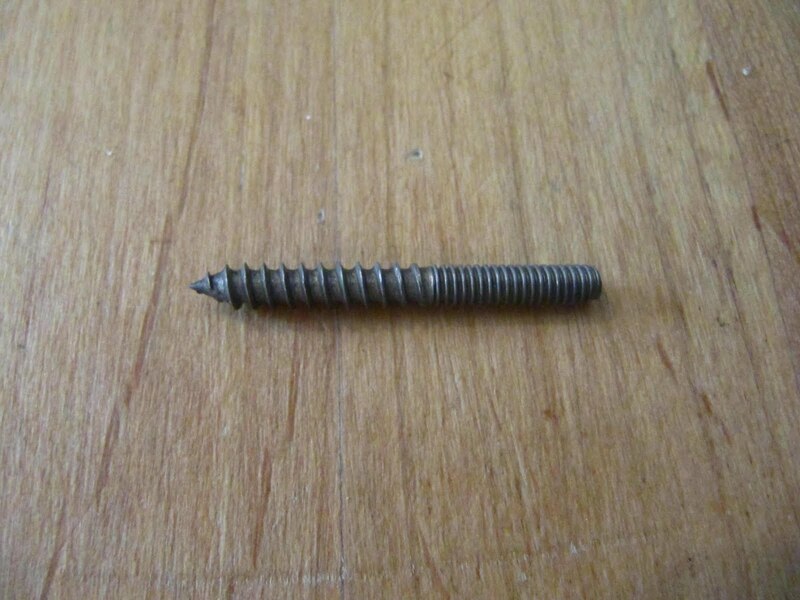 You may have to pre-drill depending on your wall. 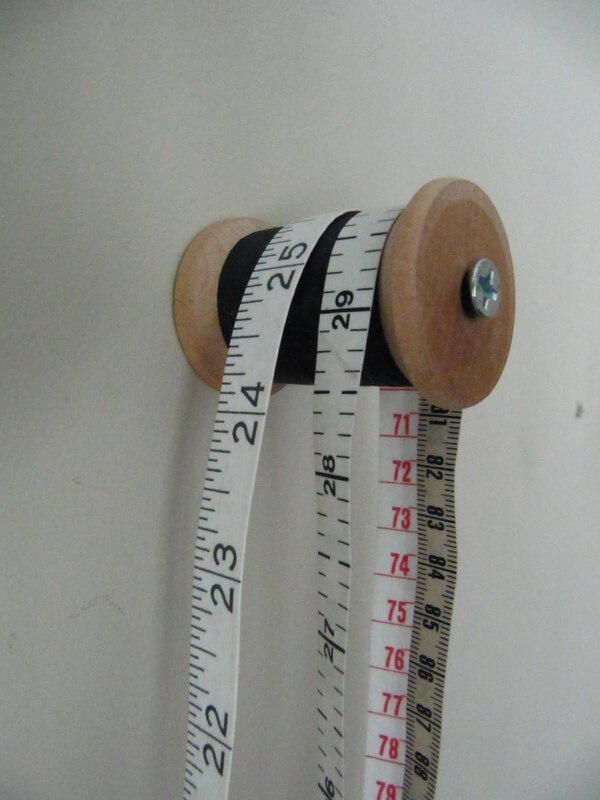 Now it's a great place to hang all those tape measures that were all over the drawer in the first tutorial. Easy and accessible when they are hanging up. If you want to hang a spool, but don't want the screw to show at the end like above, then you can use this double ended screw. 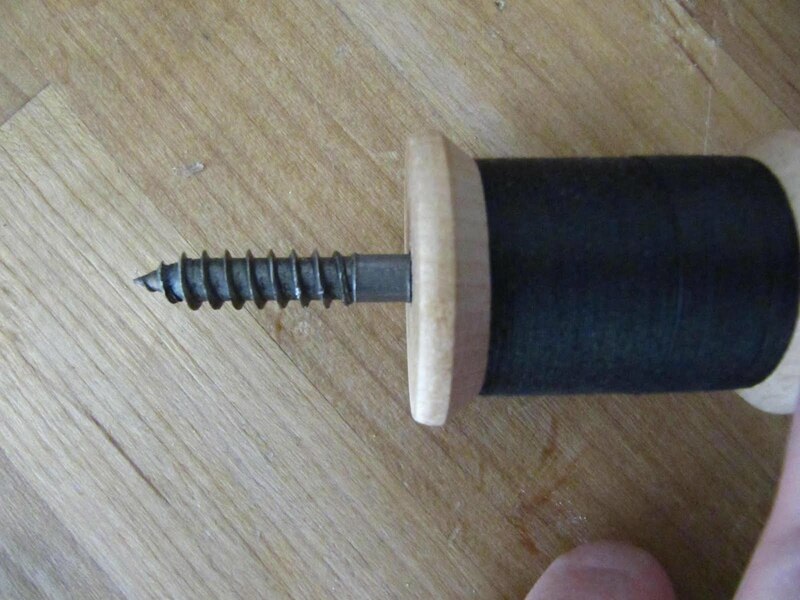 Find the screw that fits your spool and start to twist it in. 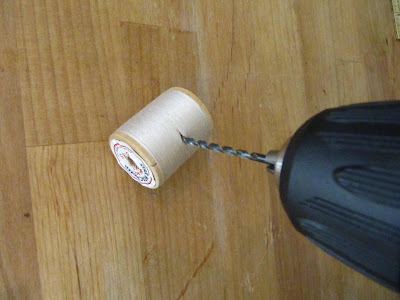 Use pliers to hold onto the screw and turn the spool around until it comes to the middle. Now the first half is in the spool and the part that's sticking out is what you'll screw into your wall or a block of wood. 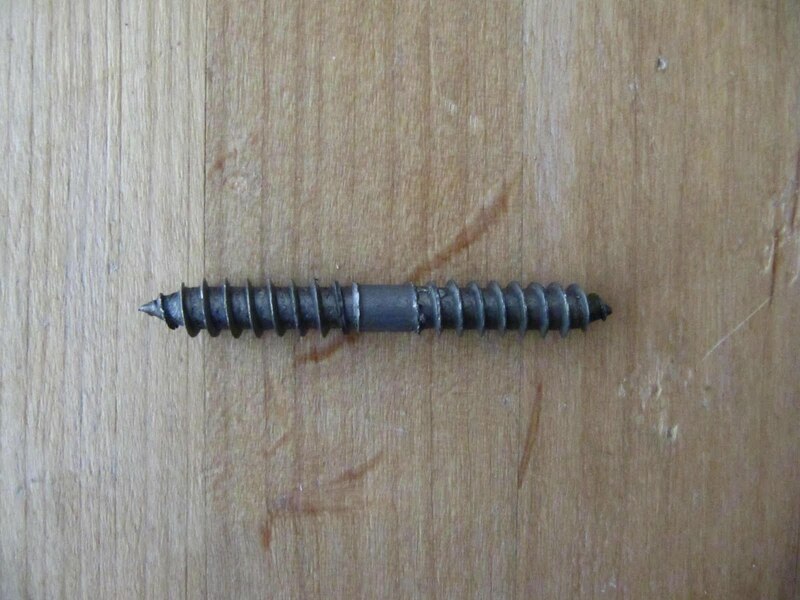 If you use a block of wood first, you can hang the block of wood to the wall with a smaller nail if you don't want to screw this honker size screw into your dry wall!! For me, I just screwed it right into an existing hole...no fear, you can always patch it after. Make sure the spool is flush up against the wall. See, same spool for hanging things on, but no metal screw end showing. 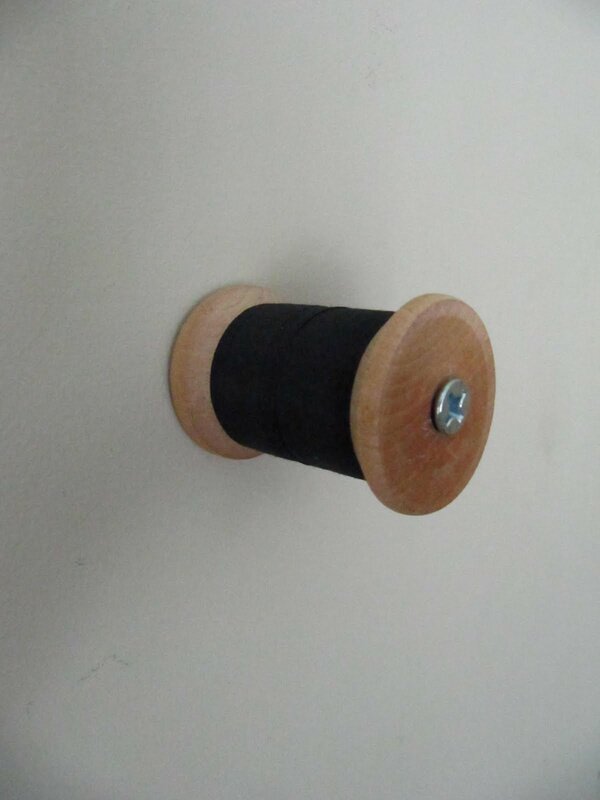 It almost looks like the spool is suspended on the wall. I hope you enjoyed these 2 easy projects. I'm going to end it here. 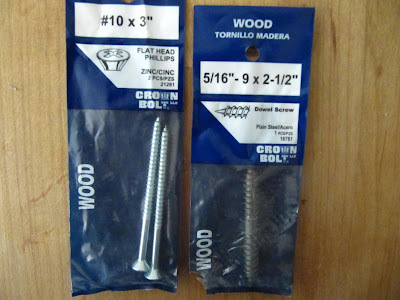 You know how I can go on with the play on words with the topic name, but this time I might "screw" it up...oops, see what I mean. This one could be dangerous! 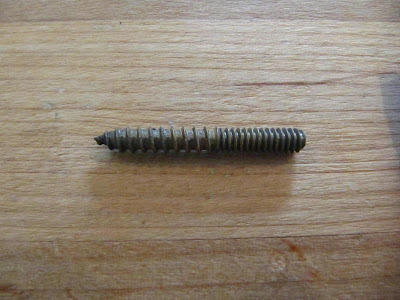 I am linking this post to the CSI Project. Their button is on my side bar. ps: Don't forget my Sharing On Sunday give away. Clever as always. Love the spool as a drawer pull. 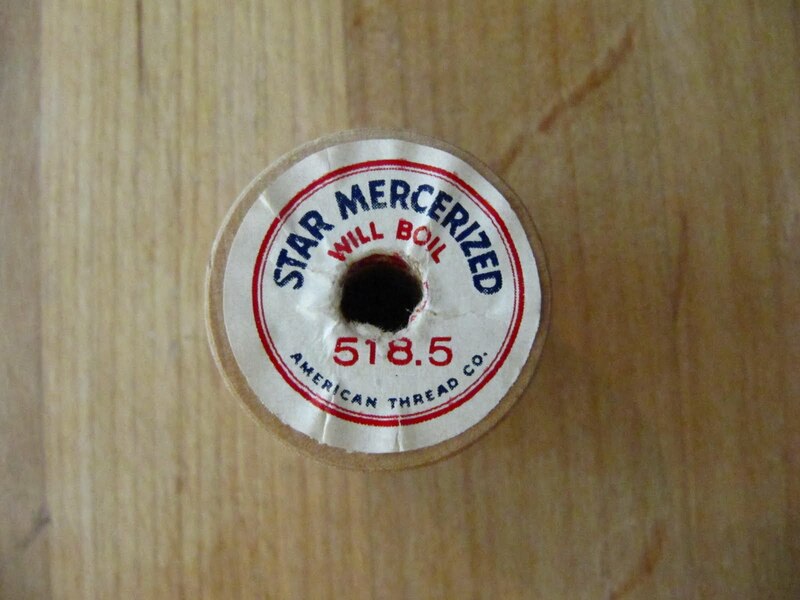 I think I still have a few of those old wooden spools. Might just have to try this. Too cute!! Another amazing tool time. Where do you come up with this stuff? 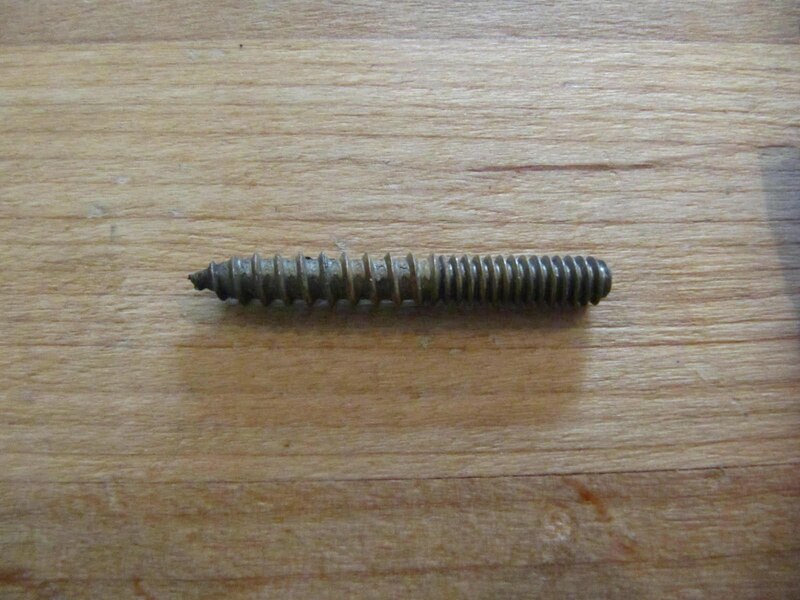 You never cease to amaze me...I keep thinking that eventually you will run out of ideas but you never do....I bet at night you don't count sheep you count all the screws in the box. Great idea. 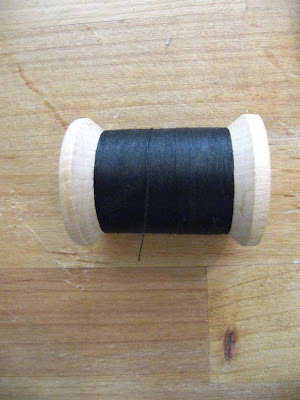 I used to have wooden spools of thread but then an experienced quilter told me to throw them away....told me thread deteriorates over time. So...no more wooden spools for me. *sigh* BUT...if I find any in thrift stores, I will remember this tip!!! 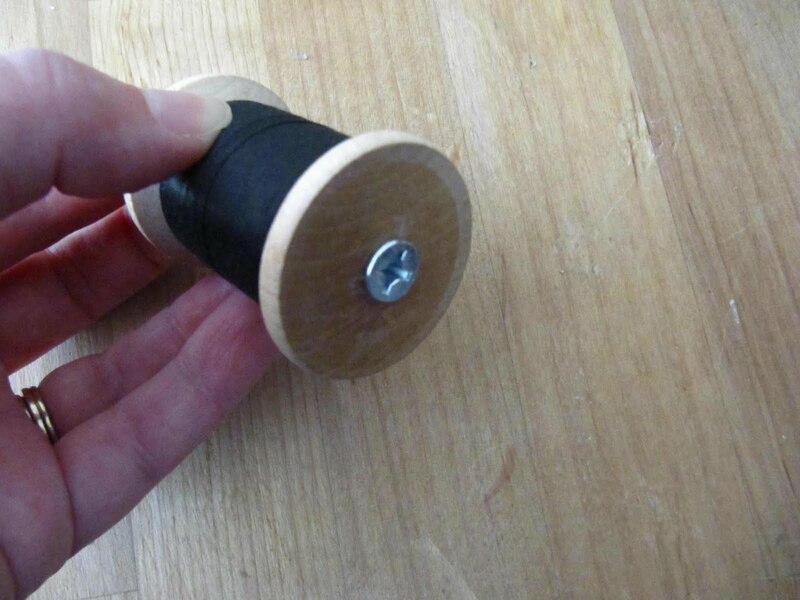 I have a bag of wooden spools I've been saving for just the right project ,thank you . OMG. I think you must wake up thinking of weird stuff! This is so cool! 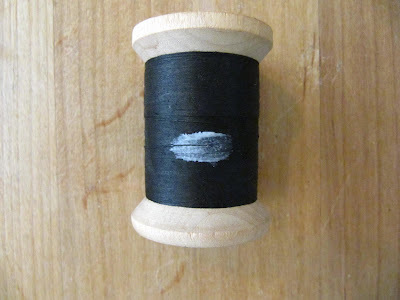 Honestly, sometimes I see spools of cheap cheap thread that I'd never use for sewing and this would be such a fun idea for usage. Now come up with what to do with my trimming scissors when sewing other than putting them around my neck! Good ideas! 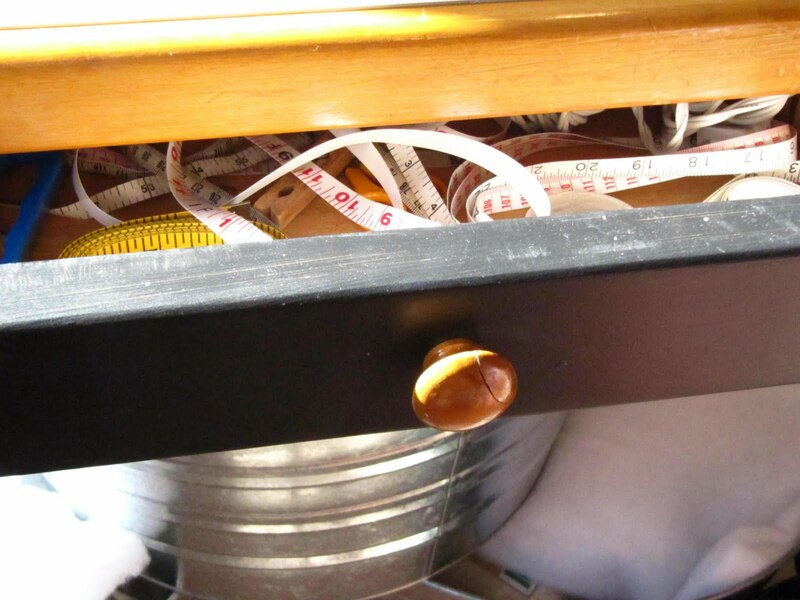 I don't have the drawer to do that with, wish I did. 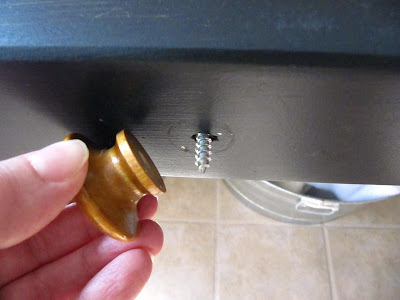 Think I'll be on the look out for a little cabinet to do that with! Too cute. Can't wait til I try that one. This is a great way to use up some of those old threads that have been hanging around for ages. Great idea! 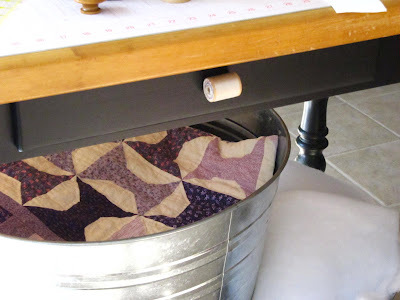 More great ideas! Thanks Karen! And thanks for all the buttons! Wow, that was quite a collection! 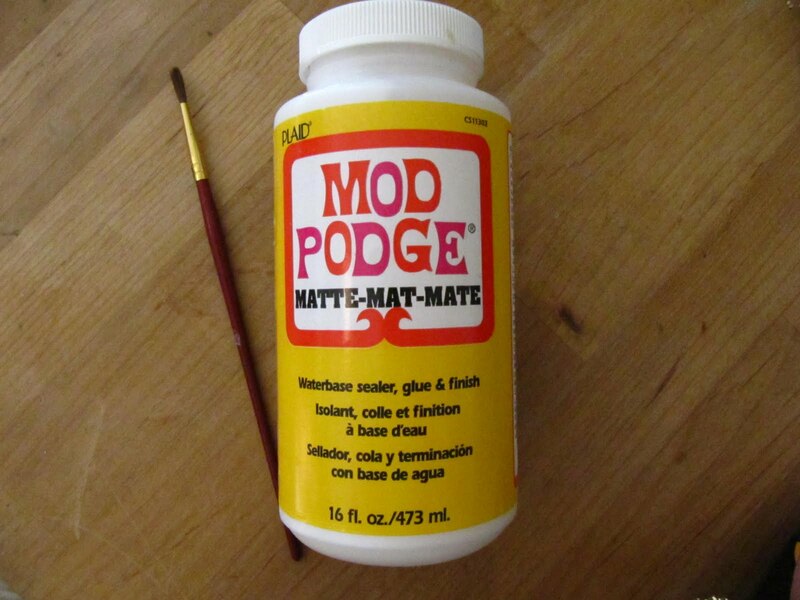 Now I'll have to get crafty and see what I can come up with for them. I'll let you know! I have tons of wooden spools of thread from my grandma and my MIL. This is an adorable idea. I especially like that it is holding your tape measures! 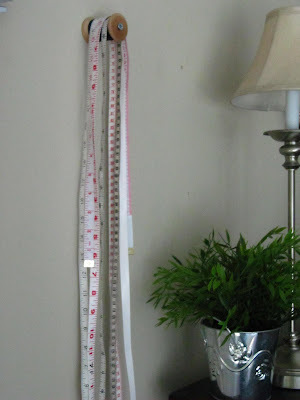 Mine are always falling on the floor after I use them so this would be a great idea to change that (and much prettier than those plastic hook thingies). I love your brain! 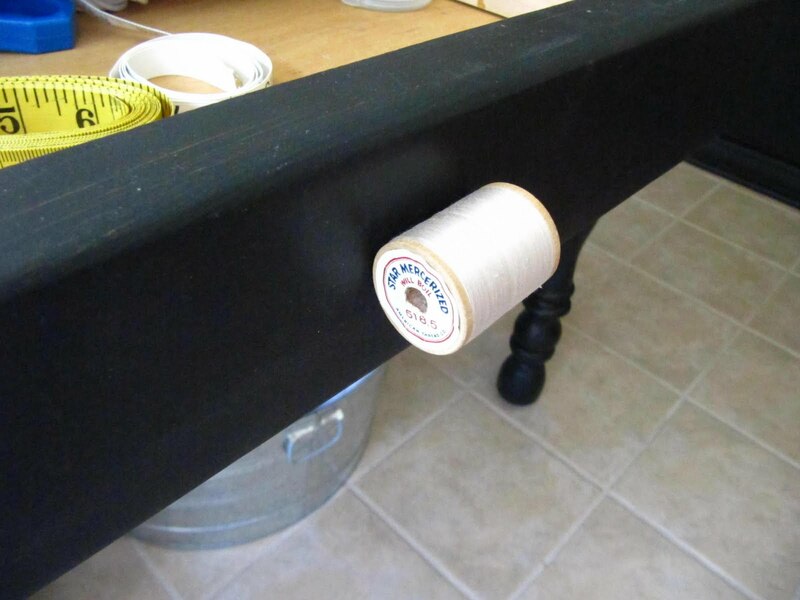 I really like the idea of the spools as drawer pulls. Great idea. What really neat ideas for those old wooden spools and just think--I'm remodeling one of our bedrooms into a new quilting studio. Thanks for the ideas. like you did. That is a great idea. Another - "Why didn't I think of that"!! 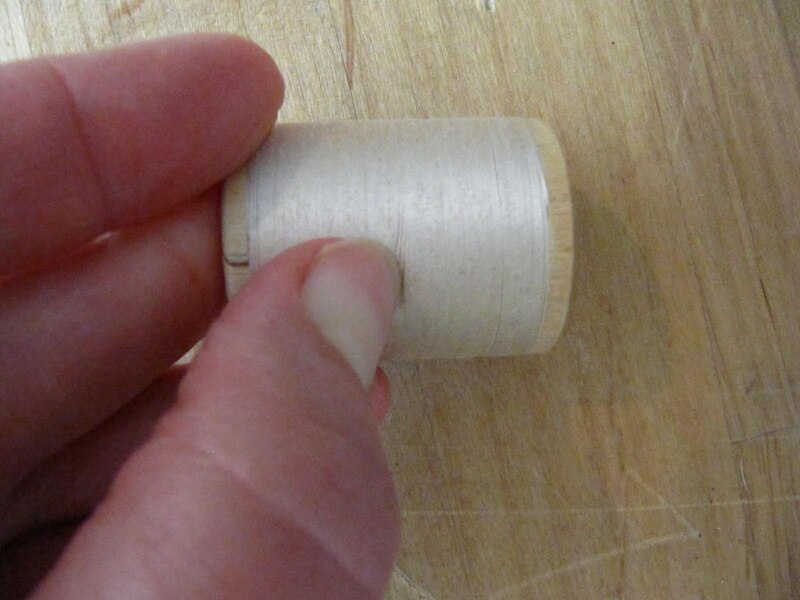 Overwhelmed with all the crafty notions on your pages , a great site. I love both those ideas! Another reason to go raid hubby's shop. Oh my gosh you are too cute. How do you ever come up with all these neat ideas. I just discovered your site! What a wealth of great ideas! Thanks for sharing. I've posted a bunch of links, but I don't thing I'll get through it all tonight. Well done! so cute! 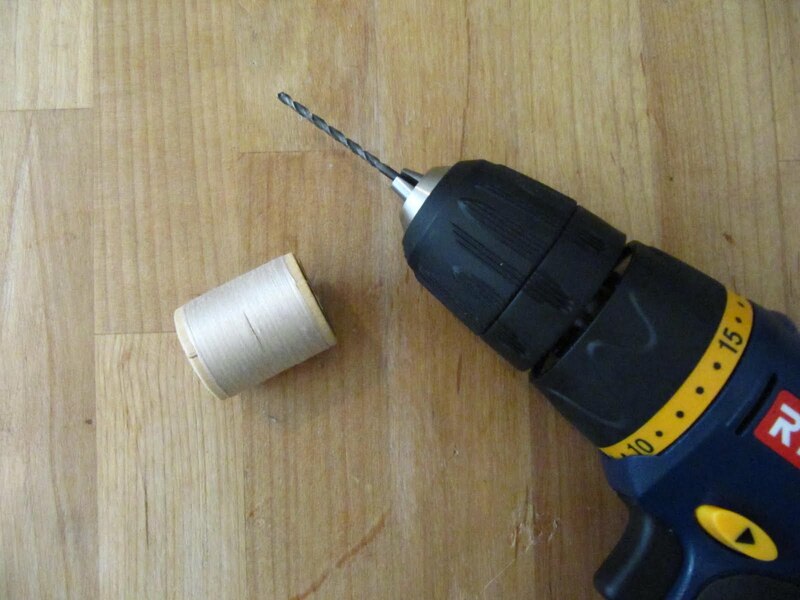 i have tons of those old wooden spools and may just try that. thanks for sharing at csi! 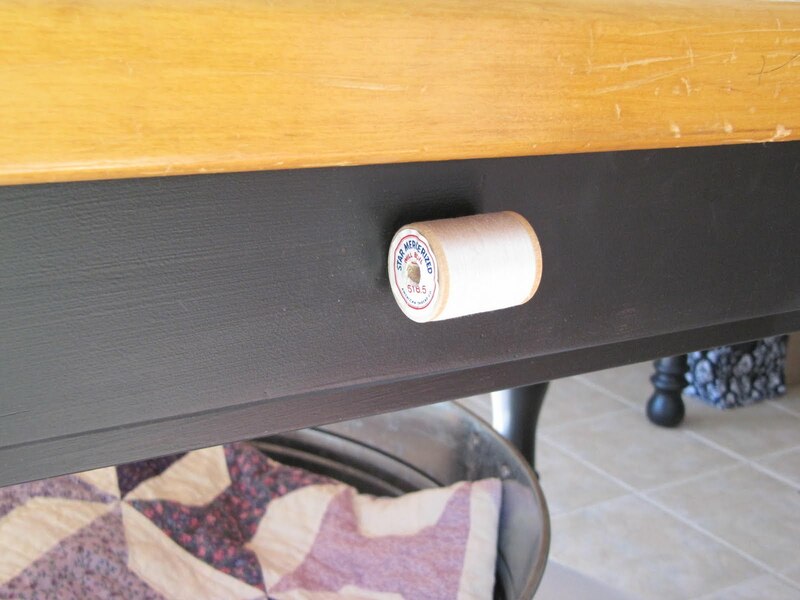 Quite the clever idea!!! Great tutorial! Fantastic ideas! 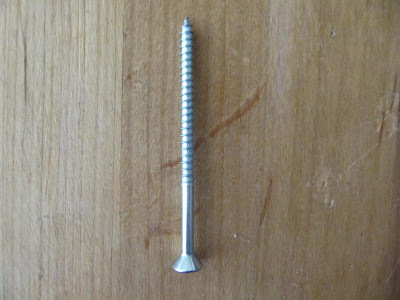 I put a link to your post on my blog at http://needlework.craftgossip.com/tutorial-spooly-hooks/2010/06/18/. I hope it brings you a few extra clicks.